Baffin Titan -100 Extreme Cold Boot First Impressions | FISHING FURY - A Fishing Blog with Attitude! Nothing can ever wash away the rancid tang from the mouth of the ice angler who has had their boot filled to the ankles with ice water on their first step onto a solid lake in winter. Oftentimes that pristine freshly fallen snow hides beneath it the day-ruining monster known to the common man as slush. Throughout the winter and especially late in the season thaws can bring about a thick layer of the nasty stuff on top of the frozen lake. It’s not often immediately apparent and is usually only discovered by the feel of liquid nitrogen hitting your toes. Even when you are wearing your fancy super warm snow boots if they are only waterproof up to the rubber sole you will be vigorously screwed by slush. Luckily one only needs to be screwed once or twice by these conditions before they join the more enlightened anglers who opt for winter foot ware that resemble and function much like your summer time rubbers. 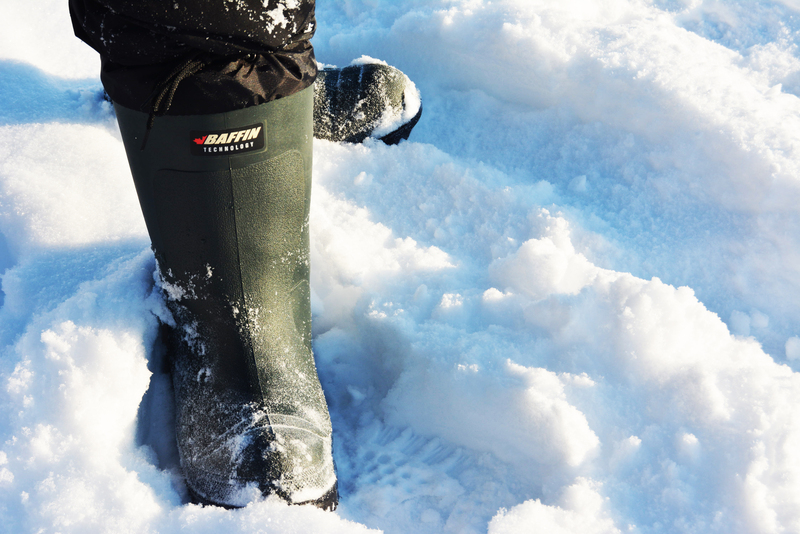 Unlike the rubbers of summer the Baffin Titans contain a space aged liner that the company claims can withstand temperatures as low as -100C. That combined with the fact that they cover you with waterproof protection all the way to the top of the boot had me sold on this pair of extreme weather gear instantly. These boots retail for a little over $100 but if they save me from the slush beast only once they will be well worth it. When you first step into these beauties it feels like you’re getting a warm hug on the foot. So far I have high hopes. Look for a product update as this hard water season unfolds. I’ve used my Titans for 3 seasons now and love them! They’ve kept me warm out on the ice and have recently proved invaluable while I was conducting field research in some forests. I’m looking to buy a new pair to use strictly for ice fishing so I can abuse my current pair a little more while doing barn chores in the winter. After a season of wearing not so great boots that did little to keep my feet warm and dry (I was most definitely screwed by the slush), I am looking to buy a new pair. I don’t mind spending the money if they work as they are supposed to and they last. The Baffin Titan looks good, I appreciate the review.